For over 20 years Gordon and Fiona Hamersley have operated one of Boston's most beloved restaurants with an intensely personal commitment to their customers. On a lovely corner in the heart of Boston's eclectic South End at the Boston Center for the Arts, Gordon serves handcrafted, bold-flavored local, seasonal food with the same passion he had when the restaurant first opened. His philosophy is simple: visit local farms and let their seasonal offerings dictate the menu. Fiona's wine list is also a seasonally changing collection of eclectic bottles, which she hopes will suit every palette and price range and also be fun to drink! She particularly loves roses in the summer and always offers a large selection by the glass and bottle. The dining room at Hamersley's Bistro has a elegant country feel with warm yellow walls with burnt orange and eggplant accents. Visit the lovely flower-filled patio, which is possibly the best place in town to spend a warm summer evening! 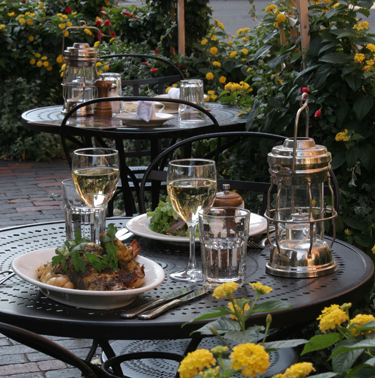 Sip a glass of rose and watch the colorful South End street scene go by. Zagat has consistently rated Hamersley's Bistro as one of the top Boston area restaurants and, in 2011, awarded Hamersley's a "28" for food! Gordon's award-winning cookbook, "Bistro Cooking at Home", is also for sale at the restaurant. Gordon and Fiona support many local causes and have a strong commitment and connection to the Greater Boston community. Like so many of their restaurant friends, they like to think, "We can do some good by sharing our good food." They serve what they love to eat.